The UFC likes making money, and that’s why the promotion is always looking to book the biggest money fights possible. Lately, that’s been even more of an impetus for the organization. UFC president Dana White and co. are already looking forward to a huge heavyweight superfight between the new champion Daniel Cormier and the ex-champion Brock Lesnar. That fight is going to be huge. The UFC is also considering a featherweight superfight between the women’s 145lbs champion Cris Cyborg and the women’s 135lbs champion Amanda Nunes. That’s another really big fight. And whenever Conor McGregor is able to return, you know the UFC is going to want to try and book a megafight against Khabib Nurmagomedov, and eventually Georges St-Pierre. Here’s the thing, though. The UFC has a number of pay-per-view cards coming up and there’s only a few select fights that can sell big numbers for the company. The other cards are going to suffer with headliners being champions who are lesser draws. Think fighters like welterweight king Tyron Woodley and flyweight king Demetrious Johnson. Great fighters, but not really guys you want headlining big pay-per-view cards. And that’s why the UFC is on the lookout for superfights. Let’s face it, there are only a few true pay-per-view draws in the sport today. Lesnar, McGregor, GSP and Jon Jones. That’s about it. So the UFC will have to get creative about who the promotion wants in its main events. That’s why I think the UFC could use an immediate influx of energy, and the solution is a return of the Diaz brothers, as Nick and Nate are two proven draws for the promotion. At a time of transition with the UFC leaving FOX and joining ESPN, the organization needs to book the biggest fights possible, and Nick and Nate constitute big fights. With Nick, he’s obviously in trouble right now with the law, but so is McGregor and fans still love him, though McGregor’s transgressions are of course lesser. Even though Nick is facing some ugly domestic violence charges, it still seems like he has the majority of fans still behind him and they want to see him fight. Just check out the comments in Diaz’ recent rant against Daniel Cormier. If and when he returns to the Octagon, I expect a huge fight for Diaz. Even though fans don’t want to see it, I still think the UFC could try and book a rematch against GSP. I think GSP wins again, but it’s a big fight. The UFC could even go ahead and give Diaz a welterweight title shot and people would understand it’s a business decision. Nick has to take care of whatever is happening outside of the cage and in his personal life before he can even think of returning to the cage, but you have to know the UFC badly wants him back in the fold as Nick is a money-making machine. Of the two Diaz brothers, though, Nick’s return is a bit more unrealistic at the moment. However, I think a return by his brother Nate is much more realistic and it’s something the UFC really needs to push for right now as there’s a number of open main event slots for the fall and winter pay-per-views. I think there’s a good chance the UFC realizes it needs Nate back and will pay him what he wants. Pretty much any fight is going to be huge for Nate even though he hasn’t fought in two years since losing to McGregor in a rematch. In fact, the time off might make him a bigger star as his return will be a huge event. A trilogy fight against McGregor is what he wants, though not realistic. What is realistic is a superfight against GSP as both men know that’s a money fight, and also a fight between Nate and Nurmagomedov. Unlike Nick, who can’t fight due to legal issues, Nate can fight, he just wants to be paid more to do so. With the UFC in a desperate situation, Nate may be in a good position to negotiate for what he wants. I’m really interested to see how the UFC puts together the rest of its 2018 schedule. We have seen the promotion’s pay-per-view numbers as of late have not been good other than the odd superfight and with a number of upcoming PPV fights and no clear headliners you know the UFC is considering its options. What the promotion wants to do most is book superfights but for the most part there just aren’t many fighters who can headline them. That’s where the Diaz brothers come into play, as both Nick and Nate are big, proven draws. Nick still has legal issues to settle but Nate is healthy and can fight if the UFC pays him what he wants. After two years away, Nate may be in the perfect spot to demand what he wants and the UFC might have to pay him. The fans want to see the Diaz brothers back, and the UFC needs them. It just makes sense for a return of one or both of these men in the coming months, and it’s going to be interesting to see what happens going forward. 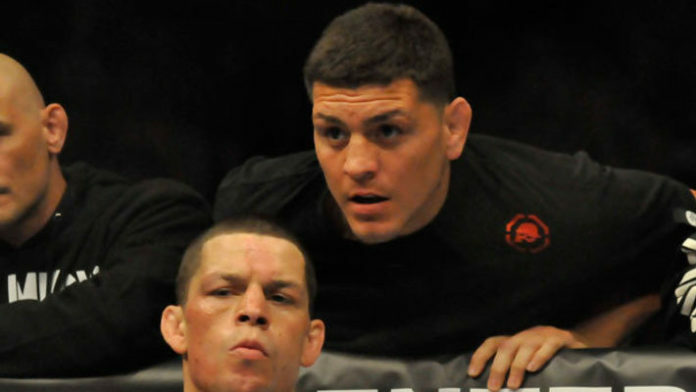 Do you think we will see the Diaz brothers back in the UFC?